Selective laser trabeculoplasty (SLT) is one of the greatest advances in the surgical treatment of intraocular pressure (IOP) in patients with open-angle glaucoma. SLT is a safe and simple 5 minute in-office laser treatment that effectively reduces the pressure in the eye for most patients with glaucoma. SLT can reduce or eliminate the need to use daily glaucoma medications. Studies have shown that less than 50% of glaucoma patients actually take their medications as prescribed and many stop taking them due to the numerous side effects experienced, cost, busy lifestyle and all other daily variables and challenges we all experience. Compliance is now controlled by your physician. The low percentage of non-responders to SLT therapy can simply begin traditional medications. Selective Laser Therapy (SLT) is an advancement over other lasers that have been used safely and effectively in the treatment of open-angle glaucoma for more than two decades. SLT works by using laser light to stimulate the body’s own healing response to lower your eye pressure. Using a special wavelength and energy, the laser affects only pigmented (melanin containing) cells of your eye unlike ALT which permanently damages and scars the eye. SLT improves the flow of fluid in the eye, which in turn lowers your eye pressure. SLT is usually performed in the physician’s office and only takes a few minutes. Prior to the procedure, eye drops will be given to prepare the eye for treatment. The laser applications are applied through a regular physician microscope (slit lamp), similar to the one used for eye examinations. 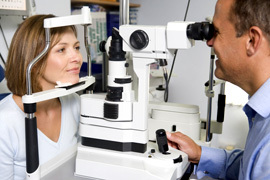 Your eye pressure may drop as quickly as in a day after having SLT performed. The doctor may treat the eye with anti-inflammatory eye drops that will be continued for a few days after the procedure. Patients have no limitations after their procedure and are able to drive home. Patients will be scheduled for a follow up appointment to allow the physician to evaluate the results. What are the side effects of SLT? Unlike with glaucoma medications, there is no risk of allergy or systemic side-effects with SLT. Complications are rare, but may include inflammation, temporary increase in eye pressure, conjunctivitis, or eye pain. Unlike older laser procedures (such as ALT), SLT does not permanently damage or scar the eye. Will I feel anything with the laser treatment? The laser treatment does not cause a sensation. You may see a green flash of light, and feel nothing from the laser. The lens used on your eye may cause some temporary redness or irritation. Will I still need to continue using my eyedrops following the SLT procedure? It is well documented that Selective Laser Therapy (SLT) can reduce or eliminate your need for glaucoma medications. Results will vary depending upon the severity of the disease. Most patients when given the option prefer to be treated with SLT Laser therapy than be prescribed the immediate use of medications. Many individuals today are also concerned of the long term side effects of medications or the effects of multiple medications being prescribed. Due to the abundance of medications being prescribed today, patients are challenged to properly take their medications. When discussing glaucoma therapies with your eye care professional, ask if you are a candidate for SLT Therapy.